MY CHILD BRIDE had a little medical issue a few days back, so we called a new clinic here on the mountaintop and made a same-day appointment, high noon, with an internist. The doctor arrived about five minutes after we did and, while she was being tended to, I stepped out into the too-small parking area where I noticed the prayer place in the far corner, a chapel. So, if the doctor can’t help you, perhaps the Virgin Mary can. I mention the Virgin Mary instead of God or Jesus Christ because I often think Mexicans feel far closer to her than the two guys, Father and Son. I too generally prefer the company of women to men. Actually, at times in my life, women have provided me heavenly moments. Men, never. But let’s not veer off-topic. As you can see below, there is no pew, no spot to sit at all, so you must speak to the Virgin standing up. If you want to kneel, that ceramic floor is hard, but many Mexicans believe self-abuse of that sort speaks of devotion. I simply stepped back into the clinic, picked up my wife, and we went home. She’s much better now. Estoy contento de ver el anuncio nuevo. Celebro que la esposa está bien. Tal vez me extraño México más que me doy cuenta. Así el interés en las noticias. Me extraño Mexico! Más que me doy cuenta! Un error. Más café antes de tratar de escribir en español. Eric: I caught the small error before reading the two subsequent comments, and I fixed it. By the way, it’s best to write always in English here because most readers, I am pretty sure, do not speak Spanish. But, in any lingua, comments are appreciated, and they accrue to your good karma. 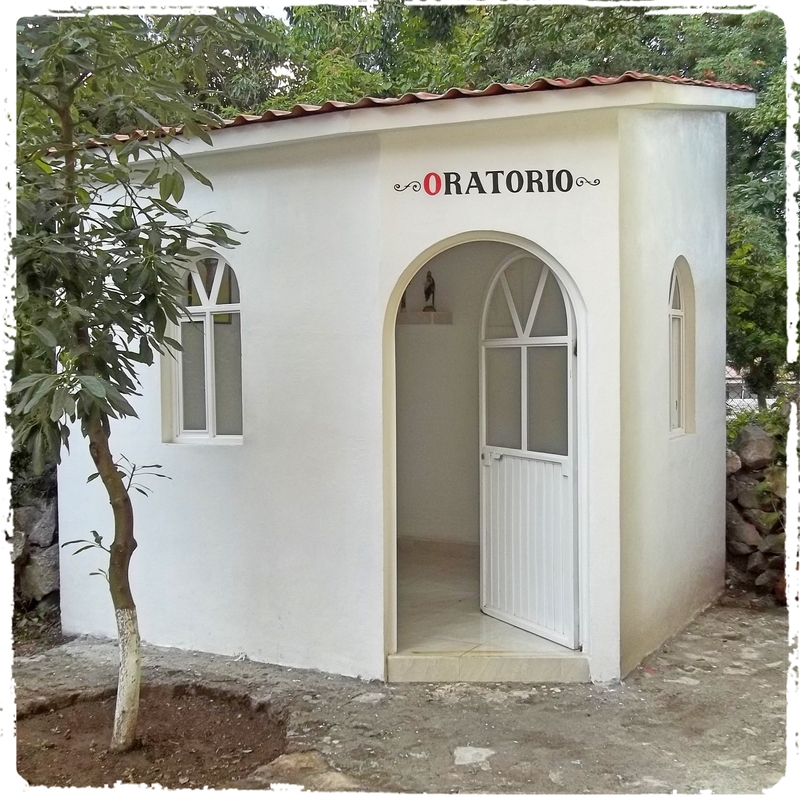 I like the idea of a little chapel/meditation room/refuge space. One of our band members has a chapel in his back courtyard, and I often see his wife ducking in there for a little solitude (four kids!). Glad to hear La Guapa Señora is better. Bliss, if I had four kids, especially if they were underage, I would put them on an ice floe. Now, that ice floe comment made me laugh. I have grandchildren, lots of them. I can’t keep up with all the stuff they do. They call me Ole Grumpy, I’m not grumpy. I’m a) confused with all the racket and goings on, and b) could live quite nicely on an ice floe. Hope the wife is much better. Bob: One child, or maybe even two, would be fine were I 40 years younger. But four would likely get the ice floe. Or, more likely, I would get on the ice floe and push myself offshore, leaving them with their mother and their homework. And, of course, children are one thing. Grandchildren are something altogether different. You can hand grandchildren back over to their parents when you weary of them. At least, that’s what I have read. I have no grandchildren, and I never will have any. Wish I did. It is not surprising that we are the generation who called their children rugrats, ankle-biters and latch-key kids and relied on television and pre-school to babysit their offspring. Andrés: Yes, and I am a first-class example. Glad the Senora is in good health. I’ve never really understood the preoccupation with the Virgin Mary. I believe there are “Jesus Catholics” and “Mary Catholics” all over the world, but I would agree that Mexican and Central/South America seem to lean toward veneration of Mary. Ray: She’s pretty much back in order, thanks. Your not getting the Virgin Mother thing is due to your being an Alabama boy and not a mustachioed Mexican. The mindset and religion are way way different. Lots of things are way way different down here. If all else fails (don’t) break glass and then pray. Which probably has as many Catholic churches as any equivalently-sized Mexican city, but no parking-lot oratorios. Kim: I bet you could find a parking-lot chapel in Mexico City if you gave it a good try. The praying place looks cozy enough even if there are no seats. Perhaps, the lack of seats discourages sleeping, vagrancy, etc. I like Catholic places of prayer, as they seem to retain a sense of reverence often missing in evangelical places of worship. 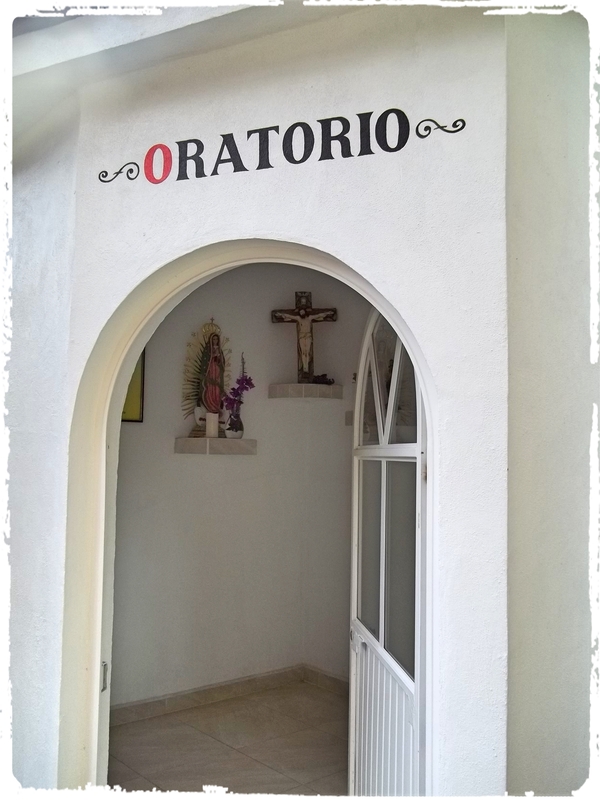 There’s a small chapel in one of the public hospitals in Tegucigalpa that is quite peaceful. I sat there while a dead body covered with a sheet in the yard was being processed for release. I was playing hearse driver that day for a grieving poor family. Ms. Teguz: The clinic is brand new, only opened a few months ago. Maybe they will do a bit more with the chapel, but who knows? As for your playing hearse driver, yipes! Guess someone had to do it. Good you stepped in.